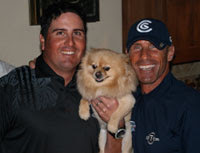 Joey D checking in with a new GolfGymBlog feature. I'll be dropping by weekly to talk about fitness in relation to the PGA Tour, the routines I run with the pros and the general ins and outs regarding trying to stay fit while living out of a hotel room. For those of you who think it's all fun and games out here, it's not. These guys are putting in the work and these are some legitimate athletes. Those who don't believe it, come walk a mile (...or several dozen) in their shoes for a week and you'll see this is serious business. More goes on in an average round than you could ever fathom. I'm off this week, so I figured this would be a good time to give a little background and recap the first few weeks of the season. 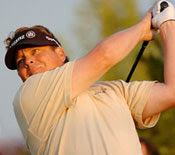 I'm working with six pros this year -- Pat Perez, Jason Gore, Tom Pernice Jr., Ryuji Imada, Jason Dufner and Charlie Wi. All six aren't in the field every week, so each tourney is it's own adventure with a different group of guys. The west coast swing was different this year as weather was a bigger factor than in the past. Guys weren't getting consistency and with all the delays, it plays into the mental part of their game. As coaches we're seeing an interference with the mental and physical. Guys working a lot harder to get warmed up and ready to go, but after a delay bodies lose their rhythm. There's an interruption in brain/body function. To get in a groove, have a tournament called and then to have to reload -- it throws you off. The intelligent guys come back in the trailer and re-warm up again and feel the difference. The trailers were retrofitted this off season and with the new set up, players have more of the necessary tools to work with. The rough weather continued and we got to the coastal California events (Buick, Pebble) you saw guys getting a bit more used to what was going on, dressing better, layering - keeping the body warm. Good advice for anyone who gets out there. I can't stress the importance of layering in those conditions. You can always peel something off if it warms up. I have the guys extend their routines in colder weather and you should too. A little more time spent warming up and stretching out will pay off in the long run. Rushing out to the tee box isn't going to do you any good if you're not limber. Stretch. Get the blood flowing and get that core temperature up. Treadmill. Stationary Bike. Elliptical. Band routines, as well. I have the pros work with my PowerBandz because they mimic the swing. Warm up rotationally. Get the spine and hips moving. Get your muscles firing in a good sequence and movement pattern. I know I sound like a broken record, but I can't stress how important fitness is to your golf game. You're better off spending an hour a day stretching than you are beating balls. Aside from the weather, there were some highlights these past few weeks. In January our very own Pat Perez won his first ever tour even at the Bob Hope Classic in the desert. I can't express how proud I am of PP. We started working together a year ago this time and it was great to see it come full circle. Pat has a different attitude. He's not going to be happy until he a top the World Rankings. As hard as he's worked to perfect his new swing, he's worked even harder in the trailer with me. You're seeing a different side of Pat -- and a lot of guys who are now taking fitness seriously. 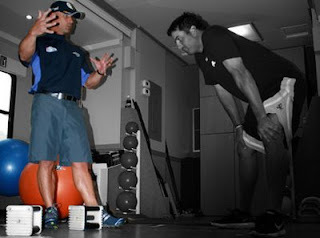 Players are realizing the importance regarding biomechanics, conditioning and physical side of golf. Not everyone is equipped to get after it as Pat does, which is fine. The key is to do something. A lot of fans look at my boy Tim Herron and don't see the most athletic guy on tour, but he's still in the trailer doing something. Functional stretching. Throwing the medicine ball. Working the bands. Lump hates his time in the trailer, but he puts in work because it knows what it does for his game. If he can do it, so can you. I've got more, but I'll save some for the next blog. Next time I'll focus on band work, the benefits that come with mimicking your swing and what to expect with the Florida swing.